With all this talk of Beastmen going around, the topic of today’s lecture, Loremasters, turns towards those classified by the Imperium as abhuman soldiers. 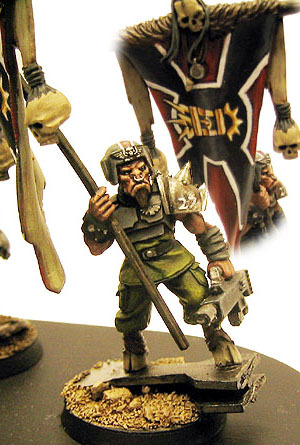 Many have valiantly served in the regiments of the Astra Militarum, though many still are enemies of Man. Whether you believe that all Abhumans are merely mutants who should be shunned, or that they still somehow have a place amid the citizenry of the Imperium, from them all we can learn an important lesson. That to go meddling with the genetic material of humanity is perhaps the height of folly, what is it loremaster-initiate Crenshaw? The Astartes are different. They’re a purposeful project carried out by the Emperor Himself in order to create warriors that would battle across the stars to protect humanity. Are you insinuating that the Emperor could ever carry out something considered the Height of Folly? I didn’t think so. Besides which the Astartes have been so transformed, they’re almost certainly no longer human. Or even abhuman. Whatever basic blueprints of humanity might once have been a part of them, they are clearly something else. Something more–but let’s not worry too much about any potentially heretical thoughts that might lead to. Instead let us talk about the Abhumans, and for data on them, let us turn to the Administratum’s findings. The Imperium recognizes 73 stable abhuman strains, of which 46 types are now listed as extinct, with a further 12 suggesting they too have died out or been assimilated into the greater population. 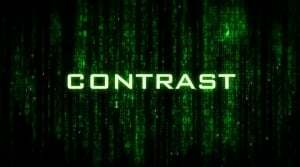 The status of the remaining 15 strains is an issue of constant debate within the Administratum‘s Tithes Chamber Notaries, sub. Planetary Census (Abhumans), the administrative body that deals with Abhuman affairs. In an Imperium where genetic mutation and spiritual corruption are often interrelated, abhumans are a focus of much controversy. 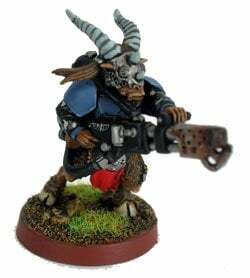 In more liberal times under the Emperor, even markedly divergent abhumans such as the Beastmen could serve in the Imperial Guard. Since the Emperor’s stasis however, only the lesser deviants, such as Ogryns and Ratlings, are considered Imperial citizens. However, they are still distrusted by the more puritan members of the Inquisition. Imperial Guard armies may make use of Abhumans. These Beastmen (or Homo sapiens variatus), Mutant Slave Levies (ordinary mutant slaves rounded up for cannon fodder), Feral Ogryns (even nastier and more primitive than regular Ogryns), Nightsiders (originating from worlds of perpetual or near-perpetual darkness, little to no ability to see but perfect warriors for Night Fighting missions), Afriel Strain Soldiers (genetically engineered from DNA taken from great heroes of the Imperium, very unlucky and unpopular), Subs (relatively genetically stable but still hideously deformed mutant sub-breeds) and Gland Warriors (Imperial Guardsmen implanted with special organs and glands that secrete combat-useful chemicals, such as stimms and pain-killers). Let us discuss some of the strains of Abhuman. The Afriel Strain was a shadowy experimental process which used genetic material from a number of the Imperium‘s greatest heroes to, in effect, make clones of them. The legendary Macharius was among the individuals replicated in this manner. 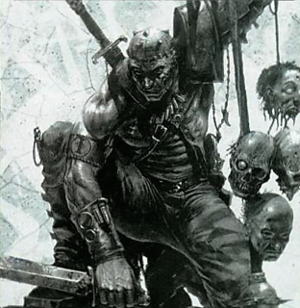 This created warriors who were mentally superior to any regular Guardsman, albeit prone to disaster. The Afriel Strain was an attempt to create the perfect soldier, though it resulted in unforeseen mishaps. For no reason that their creators could ascertain, the Afriels appeared to attract the animosity of other warriors and suffer from the most appalling bad luck. In each case when the Afriel Strain has been fielded, it has met with a period of success for its soldiers are undoubtedly superior. This superiority is not particularly in physical terms, but mentally, as they show absolutely no fear in combat. This initial period of success was always followed by the rapid decline and eventual destruction of the regiment. Nonetheless, whoever the creators of the Afriel Strain may be, they continue to experiment, fielding their “perfect soldiers” across the war zones of the Imperium. Their bodies combine the features of both human and animal. Beastmen are much more variable in form than other abhuman types. They are considered Abhumans rather than ordinary Mutants, as individual Beastmen conform to a general physical and genetic standard and are no more prone to further mutation than normal humans. Beastmen warriors which worship the Chaos God frequent the armies of the Lost and the Damned. Of these corrupted Beastmen, those that worship Khorne are known as Bloodgors, those that worship Tzeentch are known as Tzaangors, and those that worship Nurgle are known as Pestigors. Those Beastmen who have been introduced into the Imperial cult possess a simple but fierce devotion to the Emperor, regarding him as a vengeful god which demands tribute in the form of the blood of his enemies. 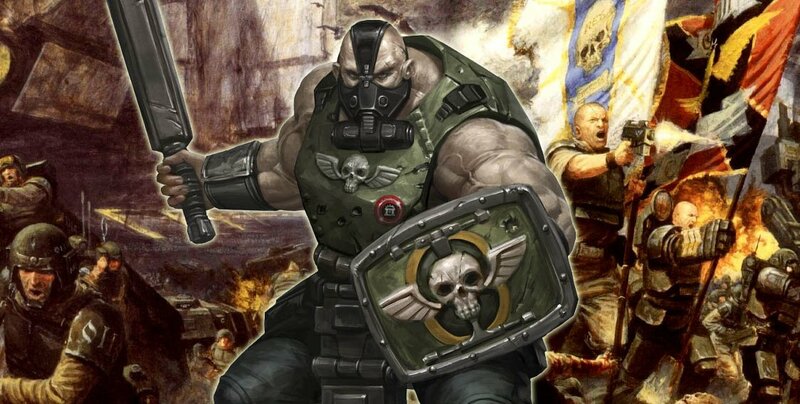 They are driven by the need to atone for the sin of being mutants by fighting for the Emperor. Gland Warriors, are a specialized, genetically modified force of Imperial Guardsmen originally designed to battle the Tyranids. 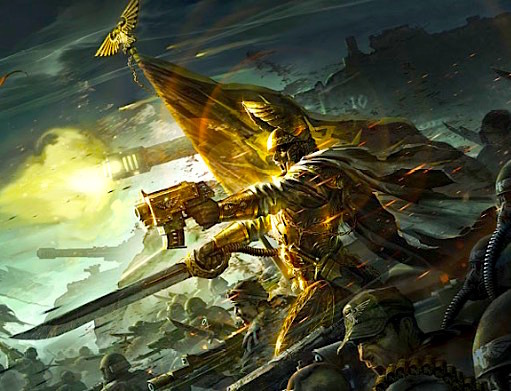 Despite being Human originally, due to the nature of their modifications they are now generally classified as Abhumans by the Imperium at large. After the Forge World of Dantris III became heavily infested and polluted by Tyranid forces, the Techpriests of the planet modified several companies of the Lostock 23rd to fight in the hellish conditions. They had many organs and drug-secreting glands implanted in their bodies so that they could survive unprotected. The glands implanted into these warriors contain the Combat Drugs known as ‘Slaught, Frenzon and Spur, which enhance their capabilities in combat, though often at a price. Indeed, Gland Warriors, like any other group who utilize such potent drugs – such as Penal Legions – can die at any time. This most often happens during combat, as their systems are quickly overcome with the drugs dispensed by their artificial glands. So there you have it, no matter what twists and turns may befall them, these Abhumans are as human as the rest of us. They know how to fight and die for the Emperor, and that’s all that matters in the end.